Royal Caribbean International® has teamed up with Universal Orlando® Resort for an exclusive vacation package you won’t find from any other cruise line. Enjoy your next adventure on the world’s most innovative ships, including Freedom of the Seas®, Enchantment of the Seas®, and Explorer of the Seas®. PLUS, experience the excitement of two amazing theme parks, spectacular on-site hotels, unique dining and entertainment and more at Universal Orlando® Resort. - Stay in the heart of it all at a Universal Orlando® on-site hotel and enjoy exclusive theme park benefits you won’t get by staying anywhere else. Book now to take advantage of this exclusive package. Additional restrictions may apply to all offers and benefits which are all subject to change without notice. *Itineraries are subject to change without notice. **Ticket is non-refundable, non-transferable, and must be used by the same person on all days. Valid only during normal operating hours. 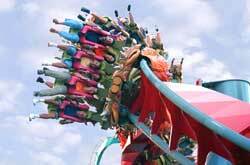 Parks, attractions, or entertainment may: close due to refurbishing, capacity, weather or special events; change operating hours; and otherwise change or be discontinued without notice and without liability to the owners of Universal Orlando® Resort. Ticket excludes admission to separately ticketed events at either of the Universal theme parks, or within any of the CityWalk venues. Some CityWalk venues require ages 21 or older for admission. Valid Photo ID required. Excludes parking and discounts on food or merchandise. ***For group bookings at off-site hotels an additional transfer fee may occur between the hotel and park. 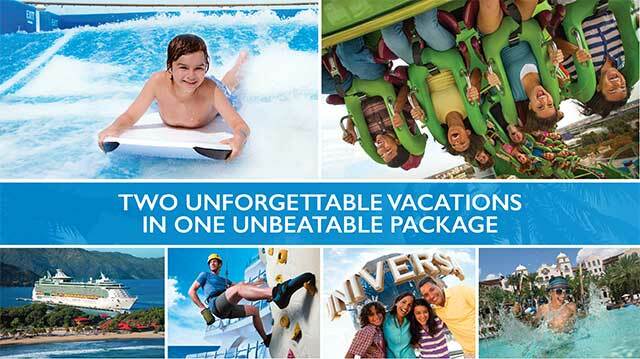 The Universal Orlando® Resort package may be booked in any Royal Caribbean booking system. The package is booked as a pre/post hotel. Once booked, all elements of the package are included (hotel stay, theme park tickets and transfers for the Port Canaveral sailings). Transfers included on ships that sail out of Port Canaveral. For all other ports, guests are responsible for transportation. Itineraries are subject to change without notice. Certain restrictions may apply. ©2015 Royal Caribbean Cruises Ltd. Ships registered in the Bahamas. Transfers included on ships that sail out of Port Canaveral. For all other ports, guests are responsible for transportation. Itineraries are subject to change without notice. Certain restrictions may apply. ©2015 Royal Caribbean Cruises Ltd. Ships registered in the Bahamas. Hard Rock Hotel ® Hard Rock Cafe International (USA), Inc. Universal elements and all related indicia TM & ©2015 Universal Studios. All rights reserved. This ticket allows access to Universal's Islands of Adventureâ„¢, Universal Studios Floridaâ„¢ and Universal's Volcano Bayâ„¢ each day of your visit.